Aka when they made their baby bumps IG-official. In a perfectly curated shoot, the newly engaged couple announced that baby Zion is going to be a kuya. The big reveal was staged via a family photo, complete with the sonogram of the latest addition to their growing brood. After just a little over a year of married bliss, Belle and Adrien are expecting their first baby! In a very creative IG post using Stan Smith sneakers with the kiddie version stuffed with a sonogram, Belle revealed that she was expecting. In May 2017, Pauleen took a shot of her cute little baby bump while getting some much-deserved me-time in the salon. 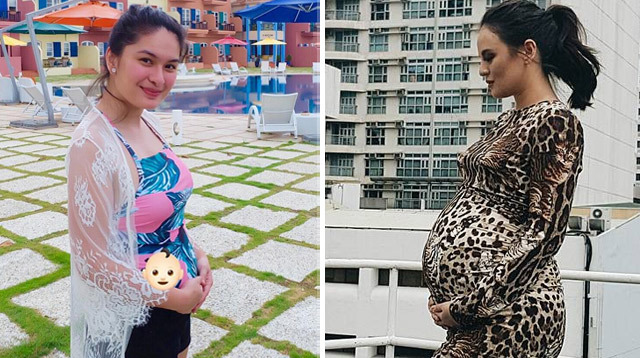 Pauleen has remained active throughout her pregnancy and has been vacationing with hubby Vic. Now, that’s one well-traveled bump! The social media-elusive Nikki Gil posted a rare photo on IG sporting a prominent baby bump. The shot shows her and BJ hanging out with friend Patty Laurel, who is with her husband Patrick Filart and her son Theo. Though subtly done, it was the confirmation fans have been waiting for! Kaye also took to IG in July to share the sonogram of their little bundle of joy. But what really puts a smile on our faces are the cute hashtags she used. #MayBabyCastilloNaSiAbad Aww!!!! Kylie debuted her baby bump in March while taking her first prenatal yoga class. She revealed her pregnancy in January (and gave birth in August). We just love confident moms who can embrace the body changes that come with carrying a baby! The TV host took to Instagram to share a picture of her sonogram, writing: "…And for this other gift!!!! @steevemago Thank you Lord for being so gracious to us!!" But what piqued the interest of the fans was the post before that, which showed just a bit of a bump. The model broke the news in an exclusive video to her BFF Raymond Gutierrez for her new reality show on E! Philippines, It Girls. Aside from the announcement, George’s baby bump photos were just TDF! Bianca’s manager Boy Abunda posted the pregnancy announcement on Instagram after the model’s first trimester. What makes this heartwarming is the outpour of support from the fans of Bianx who breezed through the maselan first three months. Unlike most couples, Yanyan’s pregnancy was confirmed by the baby daddy, Dingdong. Accompanying a sepia-photo of the two, Dong captioned it sweetly with: "We are extremely grateful because the greatest gift called life has already been bestowed upon us by God. [On] behalf of my wife, and our coming baby, we thank all those who prayed for, and with us. Faith really has its way of fulfilling lifelong dreams. #ParentsInTheMaking"
Did that take you down memory lane? How would YOU break your pregnancy news to your friends and family?